The text from Boy Child arrived as I was shuttling Girl Child from school to appointment to another appointment. The ringtone his texts make is called “Bubbles.” I chose the ringtone because it sounds like poo hitting the toilet. Plip. Plop. That way I smile whenever he texts me, no matter what the text may hold. Usually his texts make me smile, anyway. He makes discoveries and has to share. “There’s a dope Packard on the side of the road I could get for parts.” Sometimes he needs advice. “Can I cook noodles in an iron skillet?” I didn’t respond in time and he did. Maybe that’s why the folks north of the Mason-Dixon line up in Cincinnati didn’t quite get this guy. He’s a southern boy through and through. Bow ties are for wearing and cast iron skillets are for cooking. Absolutely anything. Occasionally, I DON’T smile when I hear “Plip. Plop.” When he was at school this past semester, I frowned. A lot. “The speaker for the co-op program pointed me out in front of the class and said bow ties were childish and trendy.” There were more. “A homeless guy just kicked me in the shins and ran.” This is why Boy Child is taking a semester off and working as tech support at his alma mater. That boy is smart. He knows when a teaser will get my attention. I called him. “What’s your idea?” I asked. “I’m running errands and I have to pee.” I don’t know why I always tell people when I have to pee. I’m an overweight, middle-aged woman who has had two children. Of course I have to pee. He was watching Treehouse Masters. The Discovery, Velocity, Learning and History channels and their ilk will be the death of our retirement fund. Their shows have inspired the go cart made from a futon ruined in the Great Flood of 2010, the purchasing and refurbishing of six vintage bicycles, the purchasing and semi-rebuilding of a 1949 Packard, the destruction and reconstruction of a play set into a treehouse, the launch of a rocket – or twelve – into the neighborhood. What rocket? Us? We don’t know nothin’ ‘bout no rocket. And the building of a motorized bike. Self-preservation, medication and legal issues prevent me from continuing. This time, our good friends on Animal Planet had inspired Boy Child to do something out of the box. “It is a REALLY crazy, idea, Mom,” he warned. More crazy than buying a 1959 vintage camper? More crazy than buying Bonarroo tickets for the family? More crazy than trying to convince Spousal Unit to buy back Girl Child’s first pony so I know that she’s o.k? I know from crazy, boy. The icky neighbors would crap. The ones shooting at a fox near my son’s bedroom window all those years ago. The ones who have more noisy equipment rat-a-tatting, buzzing, sucking, blowing, on a daily basis than an over-developed developer’s construction site. Those neighbors would grumble into their mint juleps. The cool nabes would love it, though. The cool nabes would BRING mint juleps. 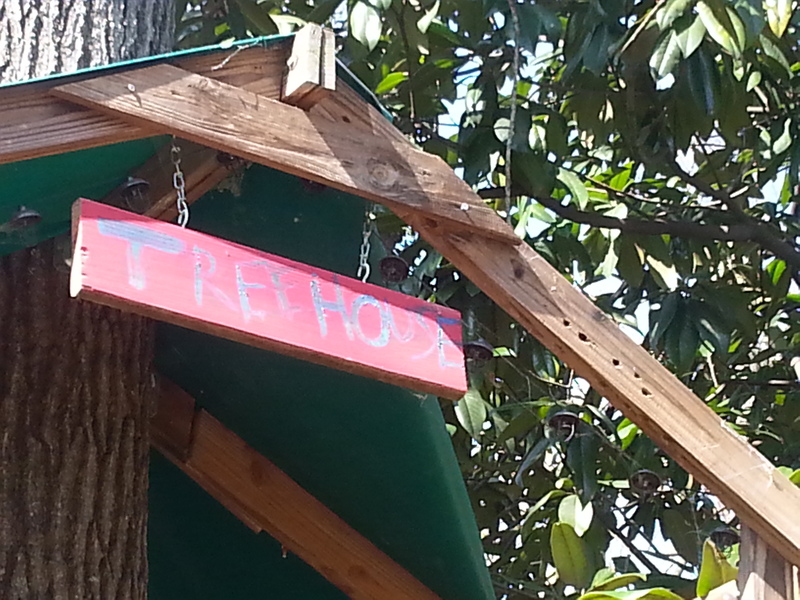 Besides, tree houses are allowed in our city within a city. Campers, not so much. I do love semantics. I pushed aside my need to pee and we brainstormed. We could use a bicycle hoist to get me up and down. Treehouse Master dude had shown that on one of his episodes. We could stick Daisy up between two of the huge magnolias in our back yard. She isn’t a Shasta, but she’d have wings. There would be a deck out the back. I would have a view. It would be very Zen. He brainstormed. I squirmed. I really did need to pee. Waitaminute. Daisy doesn’t have a potty. No way was I going to be aloft in the middle of a magnolia without easy access to a water closet. I could always tinkle off the deck, but then I wouldn’t be the only one with a view. I couldn’t do that to even the service-addicted, fox shootin’ people next door. He continued to brainstorm, but I had come back down to earth. “Dude. If she isn’t even strong enough to be deemed road worthy by you, then how can she hold her weight up in a freaking tree?” It was simple, he said. We weld her to I-beams and then we…. I got lost in the technicalities. My eyes crossed. They were swimming anyway. I really, honest-to-God had to pee. I hated to shoot him down. After all, we NEED our next generations to think outside the box, untethered by parameters that might be obsolete. Who knows, trying to hang a vintage camper in magnolias might lead to the cure for cancer. But I needed to thwart his desire for raising Daisy to new heights before he started ordering I-beams and cranes from Amazon. I am embarrassed to say, I resorted to using the old bait and switch trick from his toddler years, when we had to leave the uber cool bookstore with the train table. Instead of tempting him with a Thomas the Tank Engine book, holding it out in front of him, like a fake rabbit to a racing greyhound, I simply mentioned food. I was going to Whole Foods later, so I asked him what sounded good. He redirected smoothly and Daisy remains earthbound. Until the next episode of Fast ‘n’ Loud inspires him to put a big block engine in her. Plip. Plop. You are so funny. I still yhink my idea works. We have one of those trailers to haul a car, we use it to haul junk to the dump. Its inexpensive @ $700. The crown I just got cost more than that. OMG -That is too funny and SO outside the box. Love it, Love it!